Tampa, Fla. – (June 23, 2012) In such controversy with coping with fights this past year with so much drama and bad decisions, fighters getting caught with bad test results and many other roller coaster conflicts that have been surrounding the sport lately, It is clearly refreshing to have a breath of fresh air as fighters, promoters, media, and especially fans as hundreds gathered at the Wyndham Hotel in Tampa. 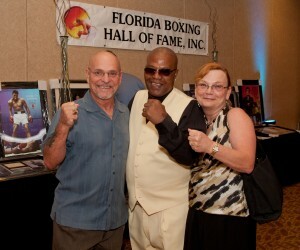 As the Florida Boxing Hall of Fame @FLABHOF (Twitter) launched its weekend festivities with its Induction Weekend kicking off with a Cocktail Party Gala. FBHOF President Walter “Butch” Flansburg and his wife Kathy shown with former junior welterweight world champion Aaron “The Hawk” Pryor. Pryor is one of the many prestigious inductees who turned out to attend the event last night. Saturday’s events will follow with a Boxing Day Show from 9 A.M. – 4 P.M. Boxing day includes sparring sessions, lectures, autographs and Inductee hand casting followed by the Gala Dinner at 7:30 P.M.